Marianne Crosley accepts the Dominion Impact Award for CLC’s Accelerate program. Dominion Energy presented $110,000 in grants to the organizations at the 24th annual awards celebration on March 26, 2019, at the Great Lakes Science Center. 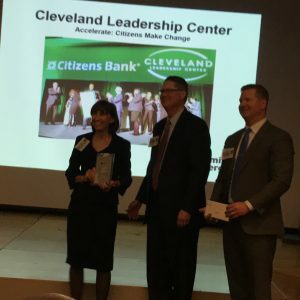 Cleveland Leadership Center received $7,500 for Accelerate, which since 2015 has provided civic entrepreneurs a public and influential platform to develop ideas that make positive change in the community. The event is presented with the support of Citizens Bank and other corporate partners. Two teens were named overall winners at the 5th annual Accelerate event on February 26, 2019. Israel Kambomba, a student from Congo who attends Thomas Jefferson International Newcomers Academy in the Cleveland Metropolitan School District, and Karson Baldwin, a student at University School, are building a project to address challenges of integration for newcomers and break down barriers between refugees and non-refugees. A panel of community judges chose the Dominion award winners from among more than 50 entries, submitted by organizations throughout Dominion’s service area. The awards recognize nonprofit organizations that make Ohio communities better places to live, learn, work and play. The Dominion Energy Charitable Foundation, the company’s philanthropic arm, funds the Community Impact Award grants. The Dominion Energy Charitable Foundation is dedicated to the economic, physical and social health of the communities the company serves. “As we have come to expect, this year’s Community Impact Award honorees devised, developed and delivered a wide range of ambitious, innovative and unique projects,” said Jim Eck, vice president and general manager, Ohio and West Virginia Distribution. “These projects demonstrate the major role our region’s non-profit and economic development agencies play in improving their local communities,” said Eck, who is enrolled in Cleveland Leadership Center’s Leadership Cleveland Class of 2019. Towards Employment of Cleveland received a special $10,000 Workforce Development grant for its Bloom Bakery Baking the Change program. The program focuses on formerly incarcerated individuals, young adults aging out of foster care and residents of economically distressed Cleveland neighborhoods. The transitional job program helps participants develop baking skills, while receiving resume building and case management support. ArtsinStark of Canton received $12,500 for its Canton Music Block program, a series of live music concerts. The Children’s Museum of Cleveland received $10,000 for its Museum for All program, which provides discounted tickets to lower-income families. United Way Services of Geauga County received $10,000 for its Bridges@Work program. The program connects working families with a variety of local programs and services. JumpStart Inc., of Cleveland, received $7,500 for its Core City: Cleveland Impact program that provides business advising and industry-specific mentoring to entrepreneurs. Trumbull Neighborhood Partnership of Warren received $7,500 for its Building a Better Warren program, which provides training and on-the-job mentorship for residents while improving city neighborhoods. Youngstown Neighborhood Development Corporation received $7,500 for its Clean Up Glenwood Avenue program. The program is working to revitalize the neighborhood surrounding one of the city’s busiest thoroughfares. Ronald McDonald House of Akron received $5,000 for its facility expansion. The Cleveland Police Foundation received $5,000 for its Public Safety Career Pipeline program. The Music Settlement of Cleveland received $5,000 for expanding its music and arts outreach and programming services at its new campus in the West Side Ohio City neighborhood. True Freedom Enterprises of Cleveland received $5,000 for its Workforce Training Experience externship program, which helps incarcerated, first-time, non-violent offenders, prepare for employment in the culinary field after their release. Union Miles Development Corporation of Cleveland received $5,000 for its Building Futures program. United Way of Greater Stark County of Canton received $5,000 for its Financial Prosperity Center. Van Wert City Schools received $7,500 for its Career Education Opportunity internship program, which provides city high school students an opportunity to gain on-the-job experience with about 30 local businesses. The Cleveland Leadership Center’s mission is to build a continuum of civic leaders committed to our community’s excellence by serving as a catalyst for civic engagement. CLC inspires and connects people to transform Cleveland by developing leaders of all age through learning and community engagement opportunities.